Exploration and discovery are the general concepts of DERELICTUS. Depending on what path you take, the experience will be very different. However, you aren’t alone in DERELICTUS. You will meet creatures: Some friendly, some hostile. The world might seem cute and cozy in the village, but remember, this isn’t Earth, this is DERELICTUS, where the laws of physics sometimes are ignored. The village, where the game starts. Unfinished. Note: The current screenshots only depict the starting area. The inhabitants of DERELICTUS have successfully avoided their inevitable destiny for a very long time. DERELICTUS is a goldmine, and “they would never just leave whatever’s below the surface of it. Only “they” knows what resides down there, but there is one thing the people of DERELICTUS know for sure: If ”they” were to take it, that would méan the end of DERELICTUS. The game takes place on the awaited day, when “they” come to claim what they’ve wanted for a very long time. But why are they coming now? Throughout Derelictus, there are ”Facilities” that “they” built when they first discovered Derelictus, to dig up the material below. The player needs to travel across the lands, in search of these facilities, and shut them down. But it won’t be easy, because only one of the facilities locations are known. To find the others, the player will have to talk with the inhabitants of distant villages in Derelictus, and look for clues around the world. 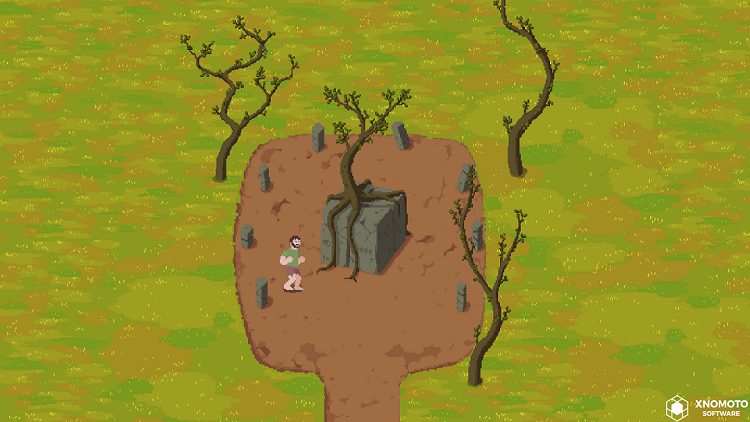 If the player manages to locate the facilities, there is still an issue when entering them. They are well guarded, by “trials”. These trials take place in a virtual world, where nothing has to follow the laws of reality. “They” have very advanced technology, and like to get creative with it. If the player solves the trial, they will need to defeat the “guardian”, to get access to the miners. But why are “they” coming now? A strange structure. Maybe there’s a puzzle hidden here? The previous text has been completely rewritten: Less fact text, more story. Looks neat. I really like the art. 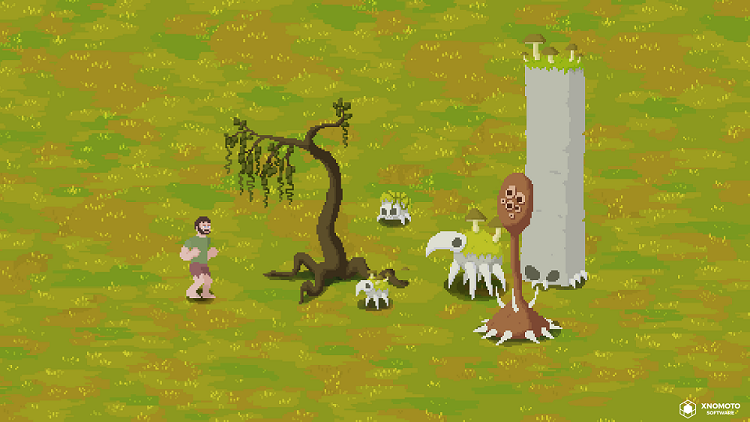 The color palette, enemy design, and landscapes look great. I would like to hear more about what kind of game this is (Adventure, I'm guessing?). I'm also curious what combat will be like. Good luck with the game. I'm eager to see more. On the strange, pillar-like rocks in Derelictus are some cryptic carvings. What could they mean? More updates coming soon. Very soon. 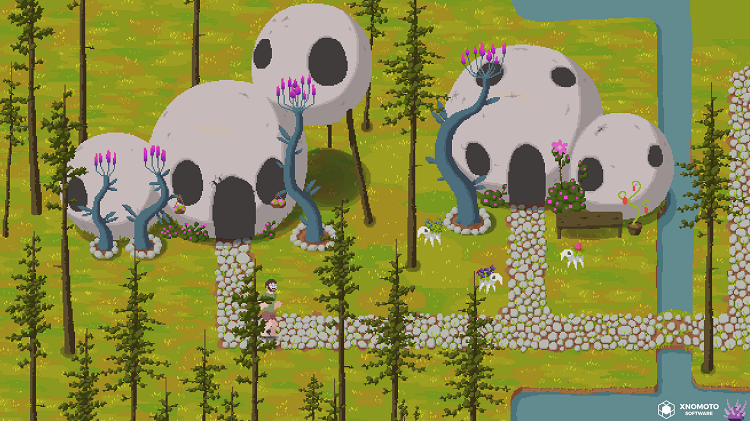 Love the skull like huts and the strange creatures. Not so sure about the human though, he seems a bit out of place.